SAAC Z. PALM was a life-long "invalid" from Brecknock Township, Lancaster County. He was unique in his Mennonite community because he walked with crutches, and because he never married. 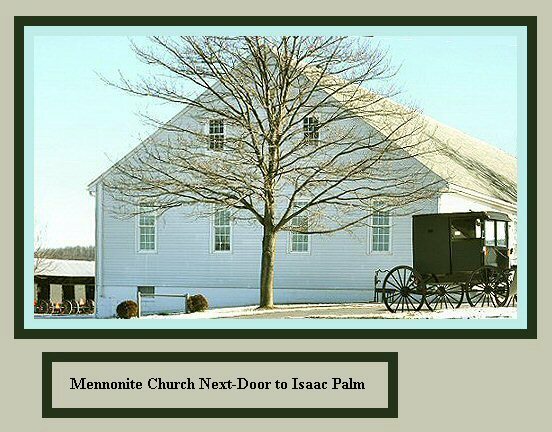 Isaac's father, Daniel Palm, was the village blacksmith of Bowmansville. Isaac was not able to follow in his father's blacksmithing footsteps, but he was able to print fraktur house blessings for his friends and neighbors. Isaac was only 17 years old when he printed this house blessing (haus segen) in 1860. I assume he decorated his printing himself, with those hand-painted deer and birds. Isaac's young age raises the question whether he was working with the nearby fraktur artist David Bixler of Fivepointville, whose family also did letterpress printing. 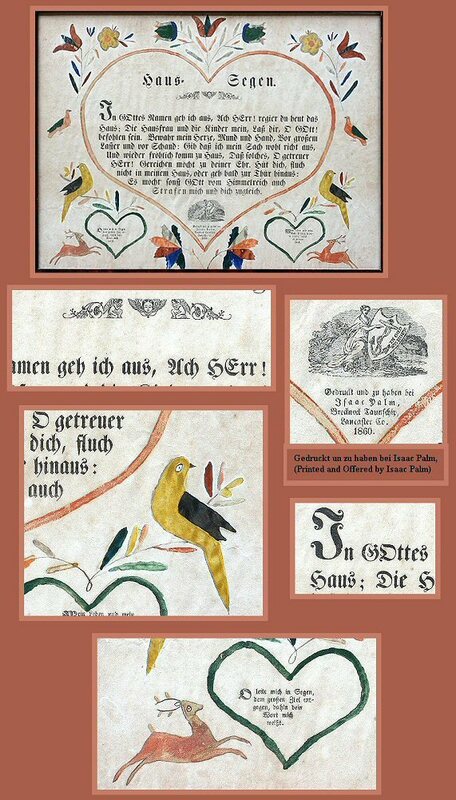 Isaac's fraktur share some similar characteristics with Bixler's. Isaac's design for his house blessings was also much influenced by the printed fraktur of Samuel Bauman. The back of this framed fraktur is inscribed by Elizabeth Burkhart: "This Blessing for the House was the only ornamental piece in Grandpa and Grandma Daniel and Mary Burkhart's living room on the farm near Bowmansville." P.S. Until now, the exact identity of this Isaac Palm had always been somewhat elusive. This website is the first time this printer / fraktur artist has been identified in print as the young Mennonite "invalid" from Bowmansville, who finally receives the credit he deserves. Above: The Mennonites, Amish, and other Anabaptists have always been anti-war conscientious objectors. Isaac Palm and his father Daniel were no exceptions. An anonymous Mennonite pastor wrote this anti-war book during the Civil War. The book was owned by both Isaac and his father, who signed their names in this testament to nonviolence. The book was printed by the John Baer company. Isaac died of "summer complaint" in 1906, at the age of 63. He had been living in his parents' home, where he lived his entire life. Isaac's obituary appears in two 1906 Mennonite publications, Gospel Witness and Herald of Truth. The Gospel Witness obituary stated that Isaac would not need his crutches to walk heaven's "golden streets." "Brother Palm was unable to attend church services for some years, having been an invalid all his life. He, however, was well informed in things spiritual, always glad to have the brethren pay him a visit and converse about heavenly things. He is survived by his mother [Anna Zerbe Palm], who is in her 88th year. Brother Palm could not walk without the aid of crutches, but he will not need them now to walk the 'golden streets.'" Above: Isaac Palm's home near Bowmansville no longer survives. The site is now home to a house built circa 1950. But this dramatically-austere Mennonite meetinghouse does survive, next-door. This building is home to a congregation of Groffdale Mennonites, also known as "Team Mennonites", as in team of horses. The building was probably built in the 20th century. I always think of these beautifully-plain church buildings as Bauhaus Mennonite Meetinghouses. It's architecture that says, "Less is more."